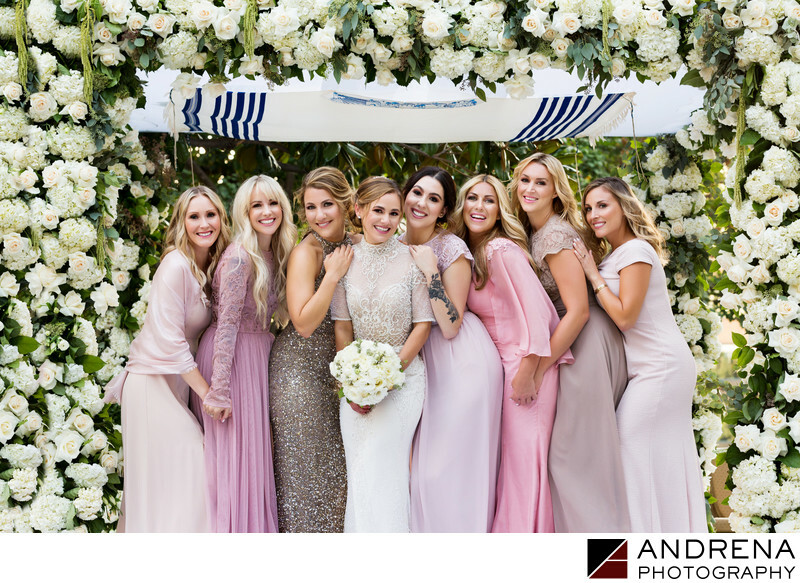 As a photographer, capturing a Jewish wedding is always a joy, and we just loved the uniquely different bridesmaids dresses that were chosen for this lovely wedding in Los Angeles. The backdrop of white roses and hydrangeas provided an elegant feel to the chuppah, which in turn lent a sense of elegance to the bridesmaids in this photograph. The complementary tones of pinks, blush, rose and champagne gave each girl a chance to be unique while creating a beautiful palette that was soft and pretty.The traditional tallit hanging inside the huppah provided a perfect canopy for this wedding image. Keywords: Chuppah (3), Huppah (3), Los Angeles Wedding Photographer (18), Orthodox Jewish Wedding (3).